The e-commerce giant's stock was only one of two FAANG stocks that finished 2018 in the green. Amazon.com (NASDAQ:AMZN) stock gained 28.4% in 2018, according to data from S&P Global Market Intelligence. 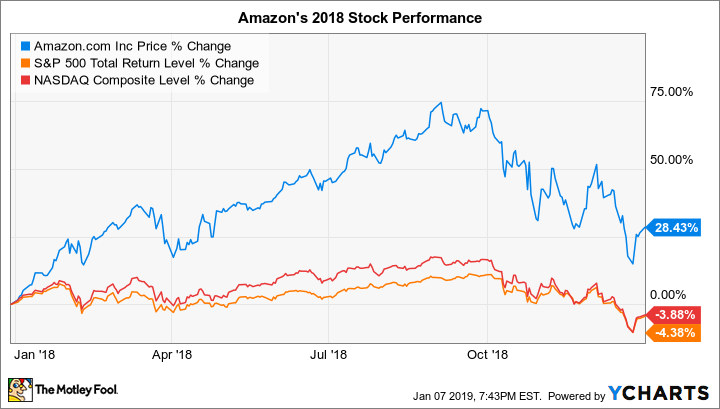 Despite the sharp pullback in the e-commerce and cloud-computing titan's stock since early October, that's still a great showing, considering the overall market was down last year. The S&P 500 and Nasdaq indexes returned negative-4.4% and negative-3.9%, respectively. Moreover, Amazon was only one of two FAANG stocks, along with Netflix, that finished 2018 in positive territory. Facebook was a double-digit loser, while Apple and Google parent Alphabet suffered single-digit losses. Data source: Amazon. YOY = year over year. EPS results are based on generally accepted accounting principles (GAAP). The North America segment's torrid operating-income growth. Amazon Web Services' increasing profitability -- and AWS was already very profitable. Amazon stock is looking more attractive from a valuation standpoint than it has in some time. That said, investors should proceed with caution with investing in stocks in general, as the macroeconomic factors -- such as slowing global growth, rising interest rates, and the trade war with China -- that led to the big stock sell-off that began in the fall remain largely unchanged.